Naturel Direct are granules of vitamins and minerals with orange, lime and black grapes flavor. 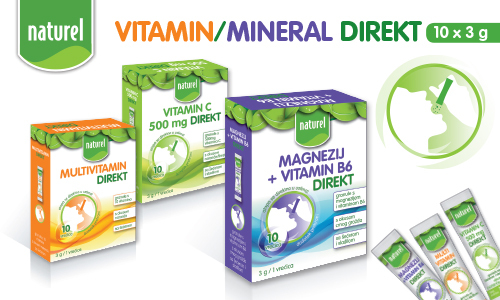 In the offer we have Vitamin C 500 mg, Multivitamin and Magnesium + Vitamin B6. They are simply consumed - directly in the mouth without adding any water, which ensures their more precise dosage and faster action. A 3 g bag that fits in each pocket allows you to keep your daily dose of vitamins always at hand. 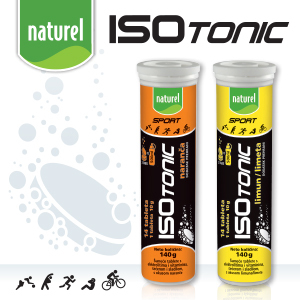 Naturel Isotonic is a dietary supplement with increased carbohydrate and electrolyte content, specifically formulated to provide optimum hydration and nutrient absorption. To obtain a daily dose of tasty and refreshing isotonic orange or lemon / lime juice, it is necessary to dissolve 2 tablets (2 x 10 g) in 500 ml of water. The 140 g pack contains 14 tablets of 10 g which is sufficient to produce 3.5 liters of beverage or 7 bicycle bottles of 0.5 l.